We’re not monkeying around. 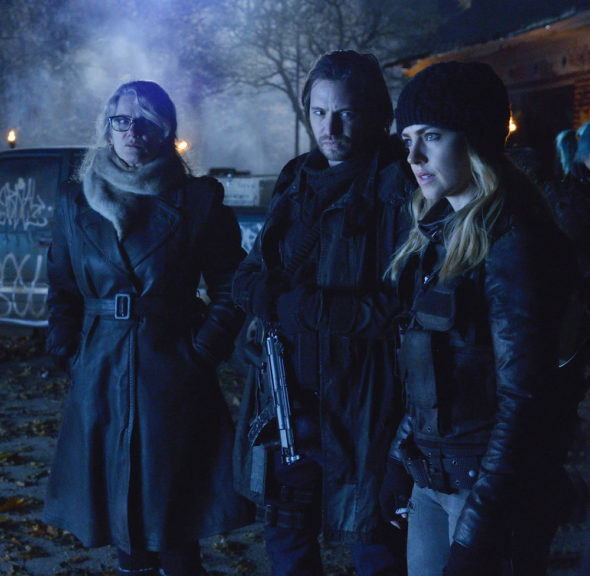 Production has wrapped on the third season of Syfy’s 12 Monkeys TV show. Co-creator Terry Matalas has shared some photos from 12 Monkeys, season three. Check them out, below. According to Matalas, the premiere date will be released, soon. When we know, you will too. Matalas created 12 Monkeys with Travis Fickett. The TV series follows the journey of James Cole (Aaron Stanford), a man from 2043 sent back in time to stop a malevolent organization known as the Army of the 12 Monkeys from destroying the world. The Syfy drama also stars Amanda Schull, Kirk Acevedo, Todd Stashwick, Emily Hampshire, and Barbara Sukowa. What do you think? Have you watched the first two seasons of the 12 Monkeys TV show? Do you plan to tune in for season three on Syfy?